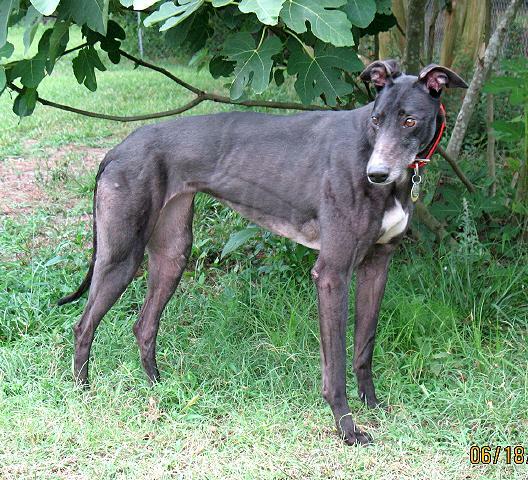 Starburst is a tall beautiful, dark red, male that raced at a thin 66lbs. He actually a pretty tall guy for his weight. His birthday is July 10, 2009. He is friendly and sweet and loves people. The vet that treated him said that he was one of the most tolerant, sweet dogs she had met. When they put him up on the table to re do some staples, instead of struggling, he just laid there and wagged his tail happy to be getting attention. He didn't want to get up when they were done because he was enjoying the attention so much in spite of getting stapled. Starburst passed his cat and small dog tests and is living in a foster home with a small dog so should do fine in an adoptive home with either. Starburst crates quietly and potties well on leash so may be a good choice for townhouse or apartment living. He pulls on leash and we are working on that. This is a super sweet, loving guy that wants to please. He gets along well with the dogs in his foster home and if the play gets rough he walks away and chooses not to get involved. Such a sweet, sweet personality. We think he would do really well with kids because of his sweet nature, willingness to please and choosing to walk away instead of defending himself. He was a big star at meet and greets. He feels it is his job to personally greet every person he sees. No one is going to get by without a kiss, a snuggle or a lean. He is almost like a cat rubbing on people. 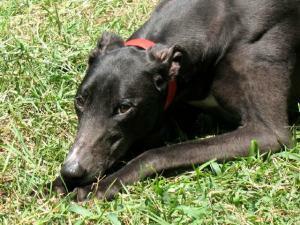 Hoffa is a beautiful, black male that just arrived from the Orlando track. He raced at 74lbs. He was born May 6, 2008 so is 3.5 years old. He passed his cat and small dog tests at the track so should be fine living with either. Hoffa is doing GREYT so far! 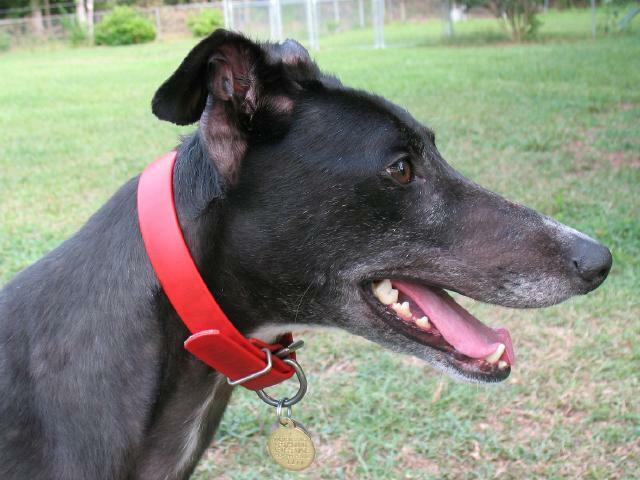 He is very laid back and sweet and is a very happy, waggy, loving guy. He gets along great with other dogs including a small one in his foster home. He is good with the children in his foster home as well!! Hoffa loves to be petted and will give kisses if you rub his ears. He eats well and has not had one accident in the house! He crates nicely and doesn't even try to get up on the furniture but he sure loves his dog beds. Hoffa is a wonderful guy that just wants to give and receive love and be a member of the family. 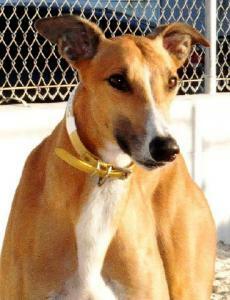 Trindad is a friendly, sweet, red fawn male that is almost 3. He was born Jan 4 2009 and raced at 75lbs. He was at the adoption kennel at the race track briefly before coming to our group and quickly became a favorite of the workers there because of his sweet, outgoing nature. Trinidad is being fostered with a cat and a small dog and gets along well with other animals. Trinidad loves to be near his foster family and chooses to follow them around although he was just a little timid when he first arrived. He is playful and loves to give kisses. He wants to please and loves people and his foster homes say he is very well behaved. He travels well and has been great with the children in his foster home. He has been nervous around toddlers 3 and under though so would probably do better in a home with children beyond the toddler stage. 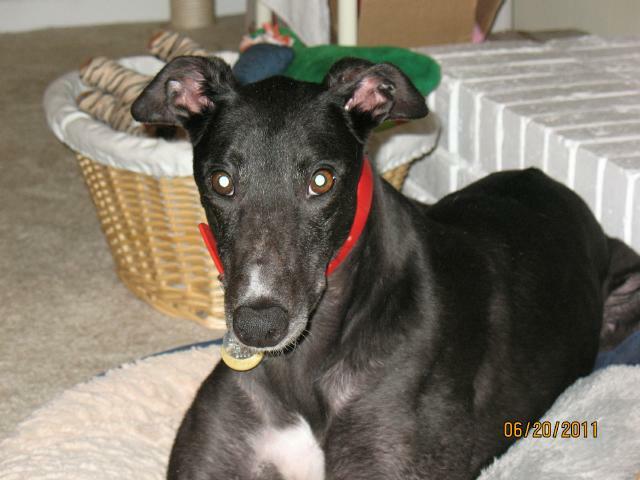 Trinidad is a sweet guy that will be well behaved and very loving. Trinidad was featured on News 6 at Noon! Click here to watch his TV Debut! Zoe is a small Irish lass that was born in Ireland 10 years ago on August 1 2001. She is tiny, racing at just 55lbs. She is very short and is literally about knee high and is one of the shortest little girls we have ever seen. No one would ever guess that Zoe was 10 years old because she is in such good shape. She is buff and has such nice muscle tone that she looks more like a racer than an older gal. Zoe is a real beauty and a real lady. Since she has lived in a home for years she has perfect house manners and behavior. Zoe lived with cats and small dogs so would do fine with either. She was returned because after years of living with children she suddenly started avoiding a 7 year old child in the home and would stay in the bedroom to avoid interacting with the child. 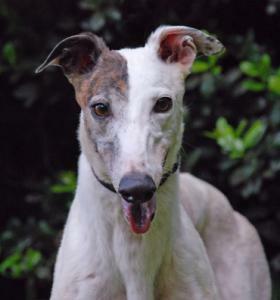 Although she has lived with children since she retired from racing, we think that Zoe would do better living in a home with adults. Now that she is an older girl, she needs more beauty rest and fewer annoyances in her life. 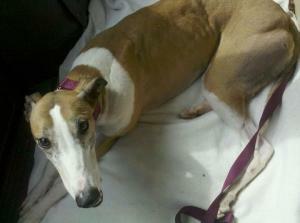 Zoe has been seen by our vet and is healthy and ready to go home. Zoe is a star! She was on the news! Since Zoe is a senior she qualifies for a reduced adoption fee of $200. Thanks to the generosity of one of our members it has been lowered to $125. Click here to see her on TV! Dentyne's entire litter had chewing gum names. She just arrived from the Orlando track. She was born on April 29th, 2008 so is 3.5 years old. She is a gorgeous girl with the most beautiful, shiny, black coat. She walks great on leash and seems like a lower energy girl that will be calm and well behaved. She is very sweet and friendly and likes to stay close. When she got to her foster home after her spay she wasn't feeling too good so didn't even try to get out of the car. Dentyne just laid in the back thumping her tail any time someone spoke to her. She has been perfectly quiet in her crate. Her trainer said she was a sweet, quiet, well behaved girl at the track too. On the haul up from the track she was a snuggler and seems to love people. She has the same father as one of our other available dogs, Iggy, and quite a few of the dogs that we have placed in the past. Dentyne passed her cat and small dog test at the track so should be able to live with either. She showed absolutely no interest in a small white dog that looked like a bunny in her foster home so seems like she is a very low prey drive girl. Dentyne does not potty well on leash so will probably need a home with fenced yard. When she is on leash she just walks next to you and stares up at you with love and doesn't spend a lot of time sniffing around. Ada Way is an extra large male that raced at 86lbs and is likely to still fill out some since he is so young. He is a big silly pup that won't turn 2 until March 4th. He is having a lot of fun playing with the kids and 5 other dogs in his foster home, including 2 small ones. 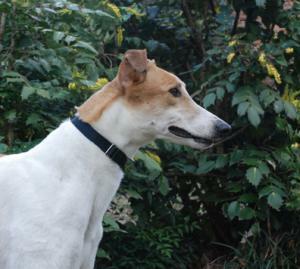 Way is a very outgoing, friendly boy that loves everyone and looks at everything as a potential playmate. He wanted to play with the cat during his cat test but didn't show any prey drive toward it. Because of his size he would need some supervision and instruction that cats shouldn't really be played with from potential owners or a confident cat. He will also need some work on leash manners. This is a sweet guy that has a higher energy level because he is still a pup. He will need a home with a fenced yard where he can run and play and someone willing to play with him and make sure he gets plenty of exercise. 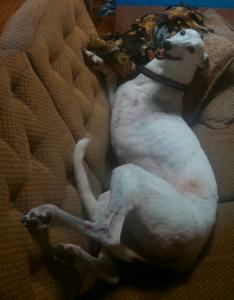 Greyhounds don't really mature and act like calm laid back adults until sometime between their 2nd and 3rd birthdays. Way seems to be a smart guy that has learned the stairs and doggy door in his foster home right away. If you want a big soft affectionate young boy, Way is your guy. 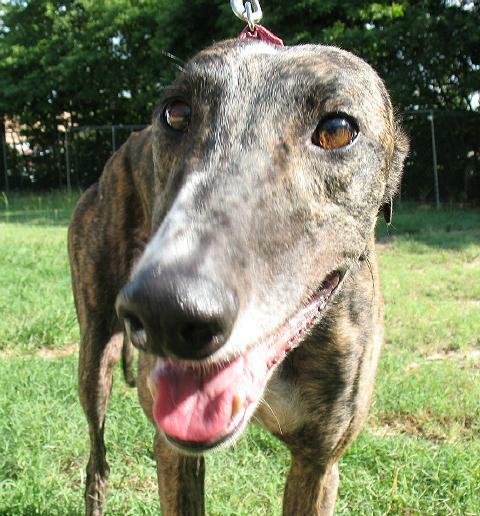 Goofy is a tiny guy that is smaller than most female greyhounds. This cute guy actually grins. That is why we picked him out of all the available dogs at the race kennel. If anyone got near his kennel he would give you a big grin and try to kiss your hand through the bars while he was wagging his whole body. If someone talked to him he would spin around in his crate in happiness. He is such a cute little, happy, loving guy we just couldn't resist him. He potties well on leash so may be OK without a fenced yard. 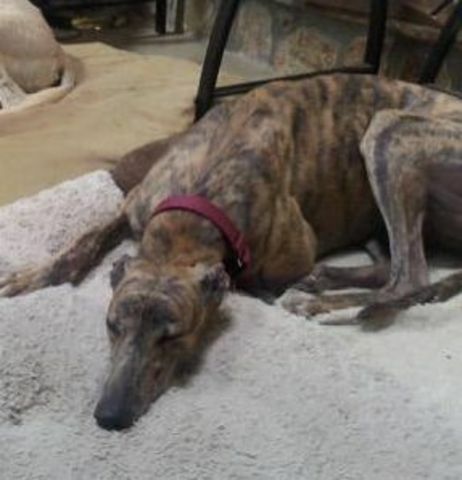 He has great house manners and likes children and has lived with them in his foster home. 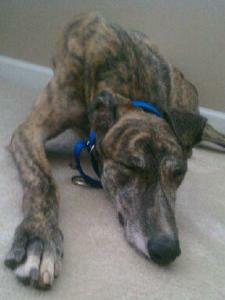 He gets along well with the greyhounds in his foster home males and females. He still needs to be tested with cats. Goofy is a fun, playful, silly guy that loves playing with toys and balls. His foster family has nicknamed him Hollywood because he is always smiling and looks ready for his closeup. He is going to be a fun little guy for some lucky family. Congratulations to his foster family the McKees!!! Goofy will be staying with them! Don't let his name fool you, this boy is no gangster. He is a real lover and is very well behaved! Hoffa is a stunning mahogany red brindle male. He is a smaller male at under 70lbs. He is a half brother to Deacon. 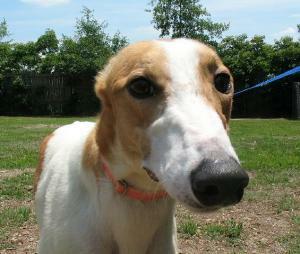 Hoffa is friendly and gives sweet kisses and is wonderful on leash too and is a very quick learner. This smally guy is very food and toy motivated so would be easy to train to do any type of trick. He calmly crates and has been very quiet in his crate and very well behaved so he might be a good choice for apartment or townhouse living. When you approach his crate he rolls over, shows his belly and waves his paw at you to get your attention. If you speak to Hoffa he will often talk back with a few little yips as if he is carrying on a conversation with you. He has been very good with the small dog in his foster home so should be able to live with other dogs of all sizes and passed his cat test. He loves children and is a real leaner that will rub against your legs similar to a cat. Hoffa loves stuffed toys with squeakers in them and will carry them around and play with them but he will also chase tennis balls. This is a sweet little guy that is a lot of fun!!! Nita Break - don't you just love that name! 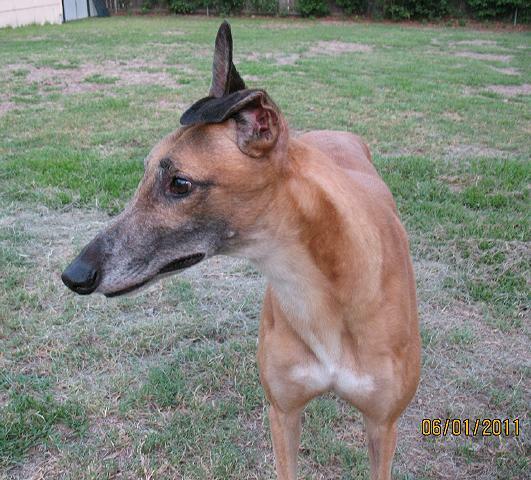 Nita was born Jan 7th 2008 and raced at 61lbs. 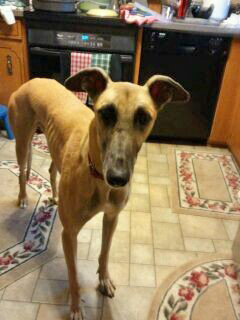 Although Nita was pretty shy at first, now she is an affectionate, loving girl with her foster family. Nita follows her foster family around and initiates play with them - but still can be a little timid with strangers. This adorable, little girl has lived in a foster home with small dogs and cats so should do fine in an adoptive home with them. Nita loves to play with stuffed animals and a plain teddy bear is her favorite. She will toss her bear up and play all by herself if no one will toss it for her. She avoids shiny floors and stairs if she can. Nita is such a stunning red brindle and seems like she will be a wonderful pet for a very lucky family! 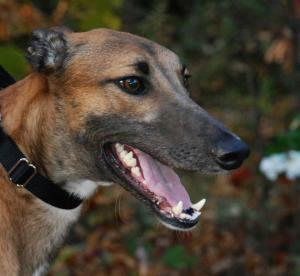 New York is a happy, outgoing boy that likes people and does well with other dogs. SO cute - just look at those sweet eyes! He followed his racing trainer around while doing chores and quickly became a favorite of his. He is doing great in his foster home and is a really sweet, happy guy. He has enough energy to be a fun guy but has been perfectly behaved and tries to please. He loves the grandkids in is foster home so should be good for a family with them. New York should be perfect in just about any situation. 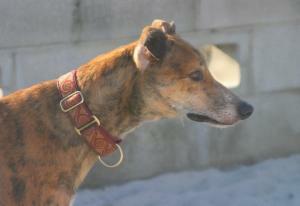 He raced at 69lbs so is on the small side for a male and has the prettiest red brindle coat. He just turned 2 on May 20th so is a young guy. He passed his cat and small dog tolerance tests so should be able to live with either and is living with some cats in his foster home. He crates quietly and potties on leash well so may do well in an apartment or townhouse. He loves to play with toys. Stuffed animals with squeakers are his favorite. You are going to love New York! Update New York has been renamed Harley and was adopted by one of our group's volunteers! Grumbler is not grumbly or grumpy at all. He is actually very friendly and loving. We think he got his name from the sound he makes when he he needs to go outside - kind of like the hamburgler in the McDonalds commercials - "rabble, rabble". 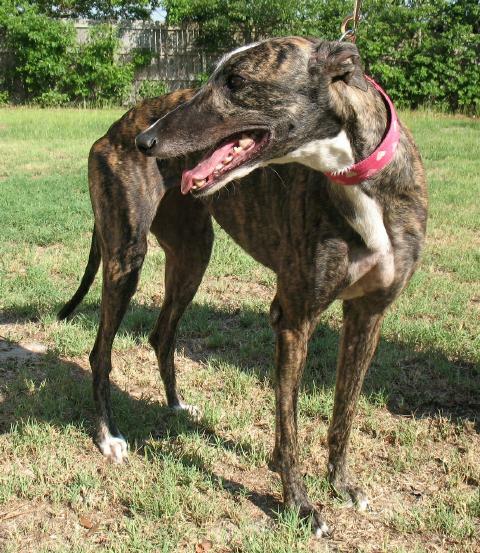 Grumbler is an extra large greyhound, a gorgeous red brindle male that raced at 83lbs. He has an unusual slightly roman nose. Grumblers birthday is March 29th, 2008 so he is 3 years old.His foster home describes him as playful but pretty laid back and no trouble at all. 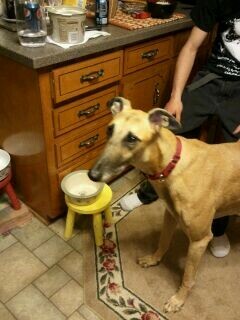 He is a huge guy with long legs that is one of the tallest greyhounds his foster home has ever had. If you like big dogs this is your greyhound! He walks nicely on leash and potties on leash so may be OK without a fenced yard if his family was willing to walk him. In spite of his size he is easily corrected when he sees something interesting on a walk like a squirrel. He settled into home life very well and has done great on potty training since he makes the cute grumbly noise to let you know when he needs to go out. 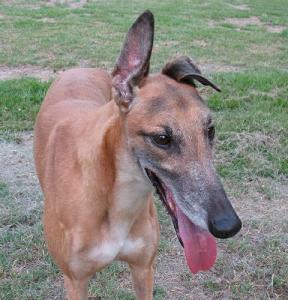 He gets along very well with other greyhounds male and female. He is a confident, happy guy that wags his tail a lot and will stand and let you pet him for as long as you are willing. Grumbler did great with kids and adults at a recent meet and greet and seemed to do OK with small dogs over 20lbs. He still needs to be tested with cats. Grumbler loves to roll around and play with toys and is usually found roaching on the living room rug! He may need some time to adjust if he would be a single pet, as he's used to having his foster-buddy around, and seems to be much happier when they can be together. He loves to show his appreciation and affection by hopping around when he's excited, coming up for ear rubs and body scratches, and talking in the funniest voice his foster family has ever heard! He will talk to you about how happy he is to go for walk, eat, or just to play. 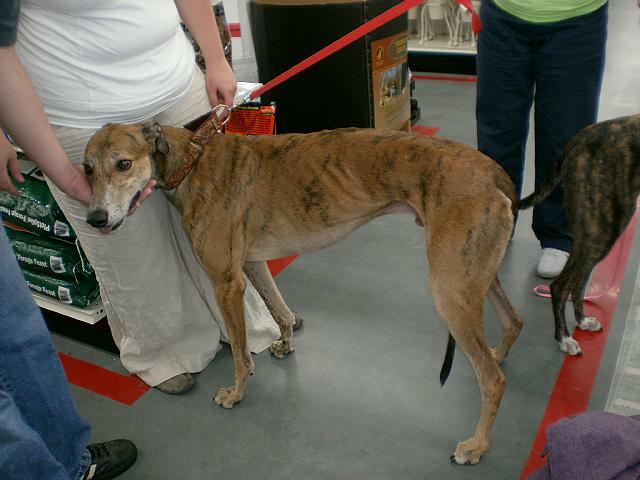 Grumbler came to us from a good owner and racing kennel and has always been treated well. You can tell from his sweet personality and love of people. He is a healthy guy that is neutered and ready to go home. 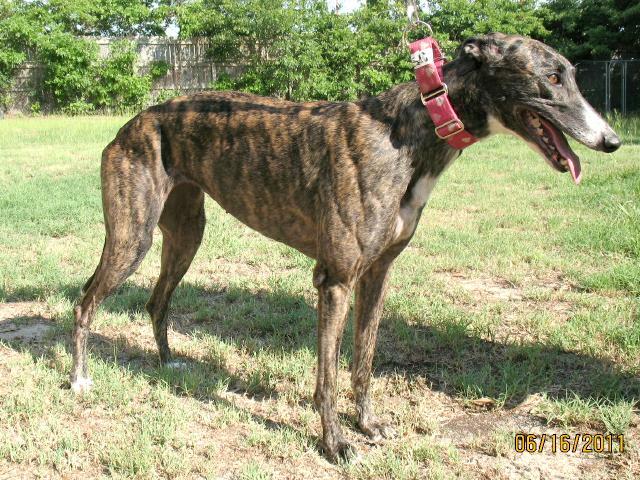 Peeler is a medium sized, brindle guy with lots of white trim that raced at 73lbs. His birthday is May 21st. He is one happy guy and is so silly that his name kind of fits. He is good with the cat in his foster home. He is very smart and wants to please. He has learned house manners after just being told once or twice. He seems to instinctually understand hand signals. His foster home thinks he might be a good dog for someone that wanted to train for competition obedience or agility. He is great with the children in his foster home (3 and 7 years old) He crates quietly and doesn't fuss about being in there although he prefers to be out. He is a velcro dog and likes to be near you. He likes to play with squeaky toys and will collect them and put him on his dog bed. He walks great on leash and loves to give kisses! His foster home says Onion Peeler is such a great guy that he would be a keeper if they didn't already have 4 greyhounds. Cobb is a sweet friendly medium sized guy that raced at 73lbs. His birthday is Feb 25th, 2008. He was a huge hit at his first meet and greet going to each person to get attention. He loved the kids he met too and seemed very tolerant. Cobb crates quietly day or night. He likes to play and was comfortable enough in his foster home to start playing right away. He likes to throw stuffed animals then pounces on them. He hasn't payed much attention to the small dogs or cats in his foster home so seems like he could live with either. Cobb is healthy, neutered and ready to go home. 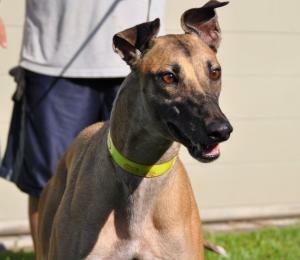 He seems like the type of greyhound that would do great with a first time greyhound adopter or one with a house full of greyhounds. 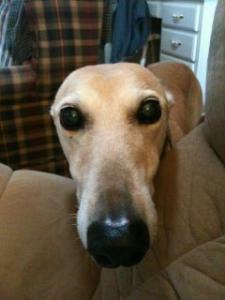 His foster home says he is one awesome greyhound. Cobb came from a very good racing kennel that takes great care of their elite athletes. 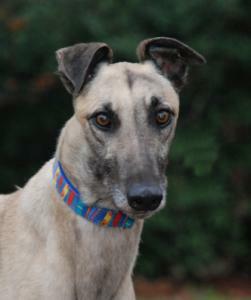 Stan is one of the largest greyhounds that we have received at nearly 90lbs. He is a sweet, loving guy that is very calm and very laid back for a young guy. He very walks nicely on leash. Stan has lived with small dogs and cats while in foster care so should be fine living with either in his adoptive home. We have adopted out quite a few of Stan's sisters and brothers and they have been well behaved and calm too. One of his sisters is even a therapy dog. Some of Stan's favorite things are to playing with toys and laying upside down on dog beds with all his feet in the air. His very favorite thing is to lean up against his person for love and follow his people around. Stan is great at stairs but doesn't potty on leash well so must have a home with a fenced yard. He is not a marker so was a breeze to potty train. Stan is a very loving guy that wants nothing more than to be with his people and will be a very devoted guy. He seems like he has some separation anxiety but just needs another dog in his home so he won't be totally alone when his humans leave. Because he tends to fuss when left he would not be a good dog for an apartment or townhouse. If you are looking for a gorgeous, big, super loveable guy Stan is your man! Stan came from a racing kennel that takes great care of their dogs. 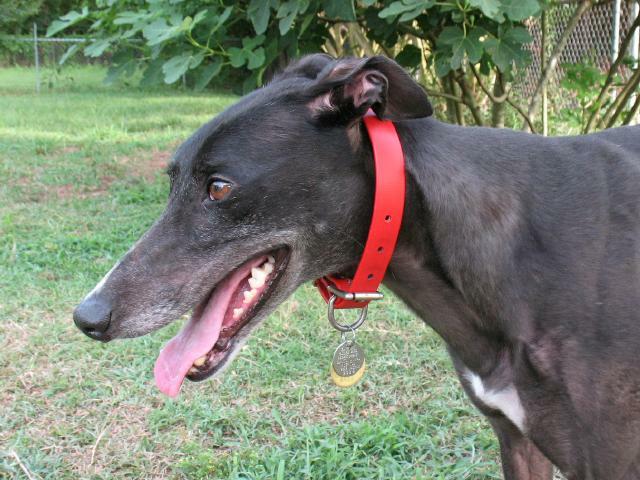 Story is a gorgeous, shiny, black girl that loves people. She will celebrate her 3rd birthday on September 21st. She loves following her foster dad around and always can be found laying at his feet. She loves playing with toys and loves to play with other dogs. She is exceptionally tolderant of a puppy in her foster home and loves to play with him. Story is quiet and very sweet and was a little timid when she first arrived but got over that quickly. She picked up potty training quickly. This is a wonderful, home-acclimated dog who is ready to go immediately into a new home but just needs a home with another dog to hang out with because she gets stressed if left totally alone. When left with another dog she is fine. 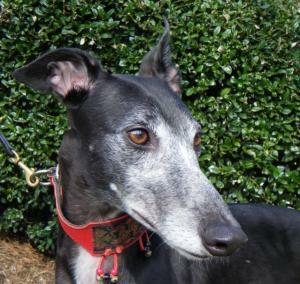 Story has lived with a young baby and 6 year-old boy so would be excellent in a home with children. Princess is a beautiful almost all white girl that has just a bit of brindle over one eye, her tail and a bit on her ears. Her birthday is October 1st 2004. Sadly she is a Economy Return, available again through no fault of her own. This is her 4th return and none have been her fault. The first was because another dog in the home didn't like her, the second was because she became terrified to go outside after being attacked by a loose dog, and the last two have been economic returns. The families have said she is an angel with no behavior problems at all. This is a sweet girl that has already been house trained and learned good manners. 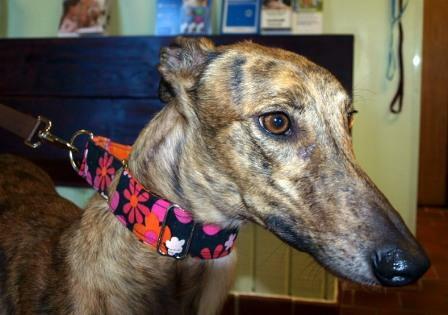 She is a sweet, friendly girl that has just a tiny bit of a timid side from time to time. She has lived with cats, small dogs and a number of children from babies to toddlers to teens. She adores kids and is very good with them. She likes other dogs male or female and gets along well with them. We are hoping her 5th adoptive home will be her Forever Home. Princess has had more than her share of bad luck already. Update:Princess Consort (Sasha) was adopted into her 5th (and forever) home with us (Duncan and Carmen McManis) when she was 7 years old. She loved to race (and often beat) younger fosters around the yard. Sadly 4 years later they lost her to bone cancer. We will always love and miss this super special girl. 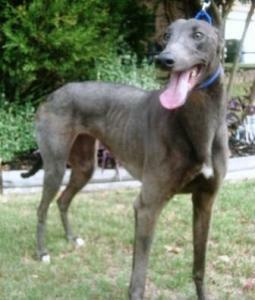 Princess Consort (Sasha) was adopted into her 5th (and forever) home with us (Duncan and Carmen McManis) when she was 7 years old.Â She loved to race (and often beat) younger fosters around the yard.Â Sadly 4 years later we lost her to bone cancer.Â We will always love and miss this super special girl. Kebo was originally adopted out by another adoption group that has asked us to help find him a home. Kebo is a great dog that has lived in a home for a couple of years. He is having to be rehomed because of a divorce and not because of anything he did. Because of schedules and new living arrangements neither of his family members are going to be able to take care of him properly. Kebo has lived with a small dog and is good with children but needs to be tested with cats since he hasn't been around them. Kebo is a friendly guy that loves to sleep on his back with all 4 feet in the air. He loves to play with toys too. No issues at all and Kebo is already home acclimated! His birthday is March 25th of 2005. His sire is Big Zee and is dam is Legler. He raced 59 races at Palm Beach and Orange Park in FL. He was an impressive racer racing at the top A level most of his career and even placing in a stakes race. 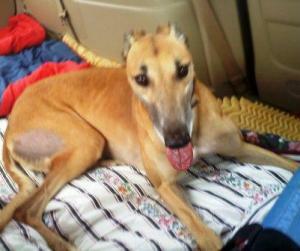 Sunny is a happy girl that likes to get hugs and kisses from her family. She loves children and her tail wags a mile a minute when she sees anyone. Even though she is waggy, happy and silly at times she is a pretty calm and quiet girl most of the time and very well behaved. She has lived with small dogs and cats in her foster home so should be fine with both in an adoptive home. Sunny will give a bark to let you know she needs to go out and hasn't had the first accident in the house. She learned how to do stairs quickly too. She likes to follow her foster family around and seems to really like people. Outside she will playbow and bark trying to get her foster parents to play with her. 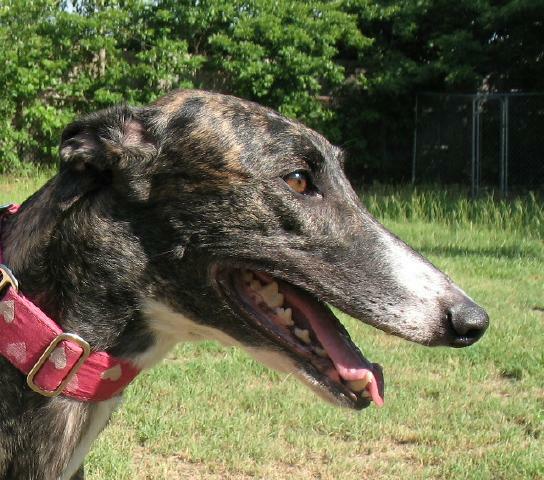 She is a very sweet girl that seems like she will fit easily into a home like she has always been there. She is very well behaved. She likes to sleep in the bedroom on a dog bed at night and doesn't care for her crate much. What a beautiful girl with that glossy black coat! 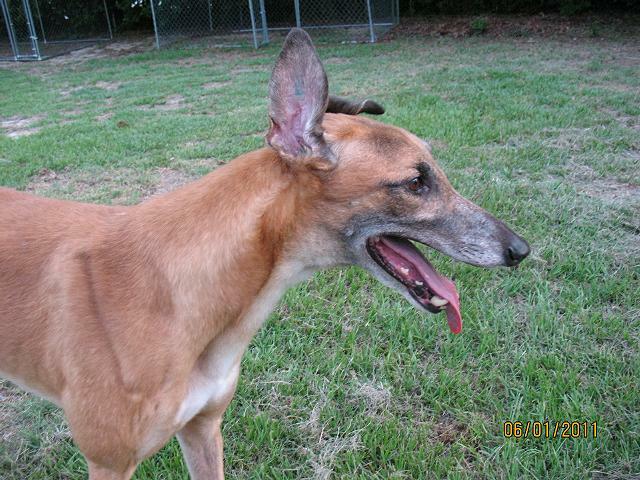 Moose was an extra large white and red male that raced at 92lbs at Derby Lane and Jefferson County Kennel club until retiring in Feb of 2011. His sire was the famous Kiowa Sweet Trey and his dam was Flying Vaughn. 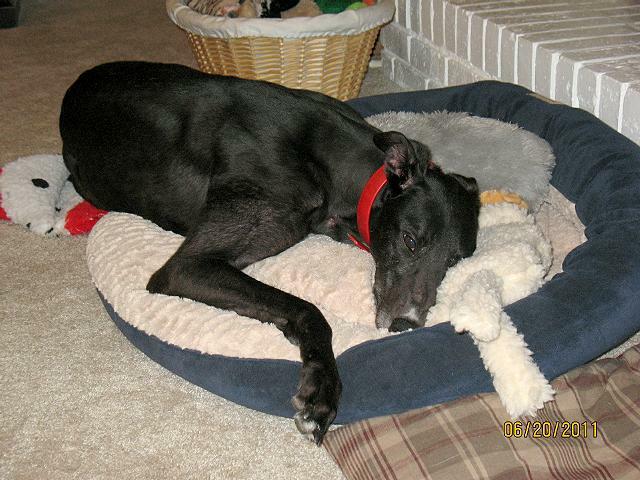 He was adopted by the Johnson Family of Greenville and was a gentle giant that helped them raise a greyhound puppy. 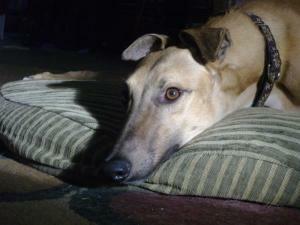 He encouraged greyhound adoption by going to many meet and greets and did home visits with his owner Joanne. He also was a member of the Hounds of East Fairhaven performing at the GA and Carolina Renaissance Festivals. 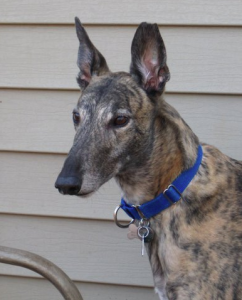 Many people fell in love with greyhounds and adopted because of big Moose.He was a very calm lazy guy but always loved any chance to chase a lure or a toy. Moose loved to snuggle with his owners and loved everyone he met. He was great with cats, birds and the small white dog he lived with and seemed to love all creatures. He had just passed his therapy dog test just a week before he died. MooseÂ was lost way too soon when a realtor left a gate open and he got hit by a car on Feb 5th 2013. When Marlie first arrived she wasn't really timid but more cautious in her new surroundings. She is alert and pays attention to everything that is going on from a distance at first but warms up very quickly. She seems to be very cat tolerant and doesn't pay the cat in her foster home any attention at all so should have no problem in a home with small critters. She has done fantastic with her potty training and hasn't even had one accident in the house. She loves to play with toys and will throw them around and will store her favorites in her crate. She is a beautiful petite girl with a happy personality that gets along well with the other dogs in her foster home and should be a wonderful pet. She loves to play and run in the yard. She might be a good match for someone that likes to jog. Not too far though. Greyhounds are sprinters and have to be worked up gradually to any distance over a mile. Most greyhounds max out at 3 to 5 mile jogs and won't ever be able to handle a marathon. Emi is a tiny 55lb red female that is 3 years old. Her birthday is Jan 28th. She tested small dog tolerant but was questionable with cats and needs further testing. She is a littermate to one of our other available dogs BT Fire. Emi is a very sweet girl that is initially a little shy but quickly warms up and likes to stand next to you while you pet her. She is being fostered with a small dog and gets along well with him and the larger dogs in her home. She walks great on leash and will go potty on leash so might do OK without a fenced yard. She is good about letting you know when she needs to go outside. She likes her crate and often goes to it on her own. She can be a bit vocal so may not be the best apartment or townhouse dog. Her sire is the famous Flying Penske and her dam is Bee A Flame. Oriana just arrived and has already stolen her foster families heart. She is tested cat and small dog tolerant at the track and was chosen as a good easy foster for a first time foster family. Baxter is a medium sized 72lb brindle male that is very outgoing and friendly and is very people oriented. He was born on April 18. Baxter is already obedience trained!! He knows sit, down, and wait and does an automatic sit when the treats come out. He walks beautifully on leash too. He has wonderful table manners and doesn't even come near the table while his foster family eats. Baxter is a playful guy outside and loves to run and play with the other dogs. One of his favorite things is to lay in the kiddie pool in the yard on hot days. His foster home dog sits all types of dogs so Baxter has had exposure to a lot of different breeds and has been friendly with all the dogs he has met of all sizes. He loves to play with balls and toys so would probably learn to play fetch quickly. If you want a well trained, happy, fun guy Baxter is your guy! After some exposure to cats we feel he is cat trainable. He was a little interested in them at first but responded well to correction.This is one handsome, photogenic guy that is also very smart! His coat was a little fuzzy in the first photos taken when he arrived but in the more recent photos of him sitting you can see how pretty and shiny his coat is now. 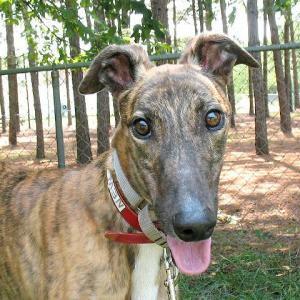 Puddin' is a cute little red brindle girl that raced at just 56lbs. Her birthday is Jan 15th 2006 so she is 5 years old. 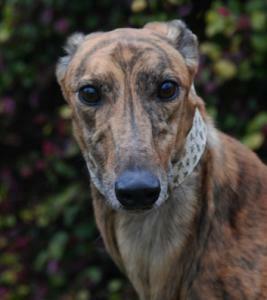 She is a very outgoing, waggy girl that greets every person she meets like a long lost friend. She potties outside and has had no accidents indoors. She crates well and often chooses to go take naps in her open crate. She may have had a little separation anxiety in a previous home when left alone. Since Puddin' has been so perfectly behaved in her foster home with other dogs around, we think that being in a home with another dog might be the key to eliminating this. Puddin' is very loving and friendly and seems to have taken the move into foster care happily and in stride. She is a happy girl that seems to adapt quickly. Puddin' is good with small dogs and cats and is living with a very small dog in her foster home. Her previous family sent her to doggy daycare to play frequently rather than leave her home alone so she is used to being around a variety of other dogs. Puddin' lived with small children and they said she was always very good with them. Jaqueline just arrived from the track. She is very young and wasn't at the track long. After schooling her about 9 times her trainers decided that she just didn't have what it took to be a successful racer and retired her. So her short career at the track only consisted of schooling races and no real races. Jaqueline is a real love according to her foster family so seems like she will be much more successful as a pet. She is a small girl that is around 57lbs. Her birthday is June 25th. Brandy is a cute little girl with the cutest ears that she can put in just about any position. She raced at 58lbs so is a small but very muscular girl. She is very young and just turned 2 June 13th. She is higher energy for a greyhound.. She would be a great prospect for an obedience greyhound or an agility greyhound because she isn't going to get bored and take a nap in the middle of class like most lazier greyhounds. She is very outgoing and curious about everything and everything makes her happy. She seems like a bright girl that will be a fast learner and wants to please. She is very people oriented and really wants to help you do whatever you are doing and would love to have a "job". She is very agile and is a great jumper and seems like she has springs in her legs. When running around the yard she takes every opportunity to jump things like the diving board, lawn chairs and easily leaps 6 stairs to jump up on the porch. She is beautiful to watch soaring over things. 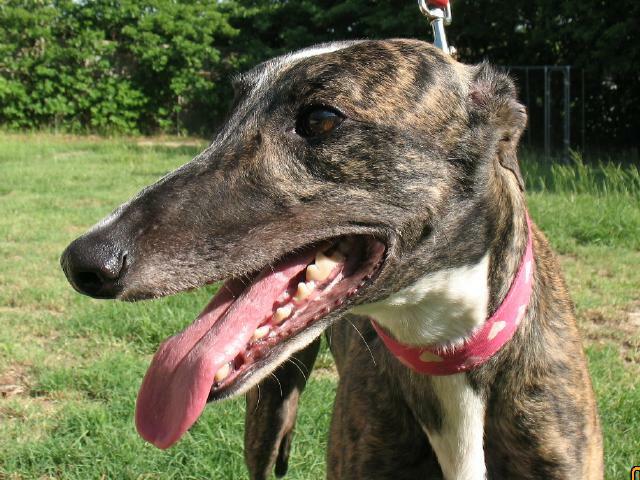 We think she would be excellent at agility because she is the rare greyhound that actually seems to enjoy jumping. She passed her cat and small dog test and is currently being fostered with a small dog. Brandy is going to be a fun girl and is the type that will be the life of any party. She does crate quietly so could live in an apartment or a townhouse. She also potties well on leash so may do OK without a fenced yard. She is going to need a good bit of daily exercise if she doesn't have a yard to play in though. Brandy loves children. Update: Brandy was adopted and she is now known as Bailey. She is one of the top agility greyhounds in the country so watch for her on TV competing at the top levels of her sport. She also is doing obedience and is excellent at that, like we knew she would be. She is still very energetic and loves to work with her mom. Bebo is a handsome medium sized guy that raced at 71lbs. He turns 3 on July 25th. He tested cat and small dog tolerant at the track so should be fine living with either. Bebo is a laid back, but friendly guy that was chosen by his trainers as an easy well behaved dog that would be good for a first time foster home. He is good on leash, crates quietly and only had two accidents in the house during his potty training. 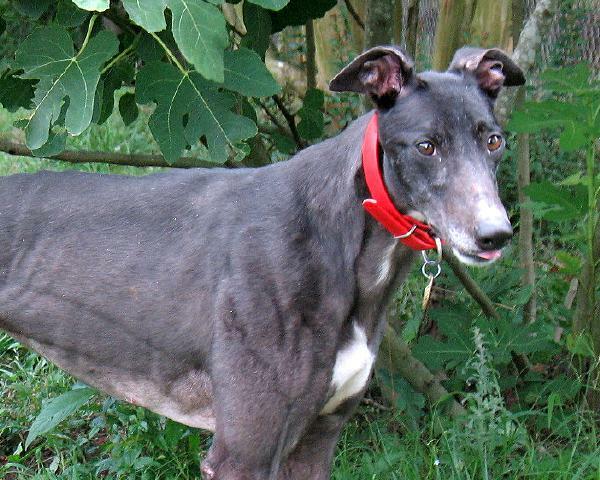 He is a fantastic boy that is calm and would be an easy addition to just about any home. Bebo has discovered toys and has started playing with them. He did good on a recent trip to Petco walking in nicely on leash. He negotiated the slippery floors and politely greeted adults, children and other dogs. 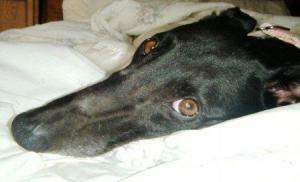 He gets along great with the other male greyhound in his foster home too. With Bebo's calm easy going nature he would probably have no problem passing a therapy dog test. Sadie is a small, happy, outgoing, girl that raced at 60lbs. She looks smaller than that because she is very short legged and stocky. She can walk right under a larger male without touching. Her sire is Flying Stanley and her dam is Kiowa Shag Shag. She likes people, makes great eye contact and does the funniest little head rub on you if she is happy to see you and she is ALWAYS happy to see you. She is living in a foster home with cats and small dogs and is fine with them. Sadie is a very young girl that doesn't turn 2 until July 3rd but is very well behaved and mature for her age. She has learned to potty on leash now so would probably be fine without a fenced yard. She is very quiet in her crate so should be a good apartment or townhouse dog. She seems like she is great with other dogs and wants to please people. Sadie is very good on leash and does the cutest little prance when she walks. She is starting to play with toys and takes her favorites and stores them in her crate. 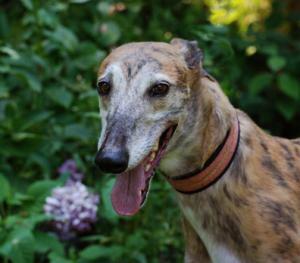 She seems like she will be a very easy first or 4th greyhound that will be good in just about any situation and has been the perfect foster according to her foster home. Besides having a great personality she is just adorable. Update: Sadie went on her first hike and LOVED it. We also discovered that she likes water and took photos of her cooling off in the lake. Ferrall is a small red male that raced at 67lbs. He raced for a long time and was very good. It is unusual to get one that is still racing at 5 years old most slow down and retire long before that. HIs birthday was Jan 2nd. Ferrall has the cutest ears. One stands straight up and the other flops down. 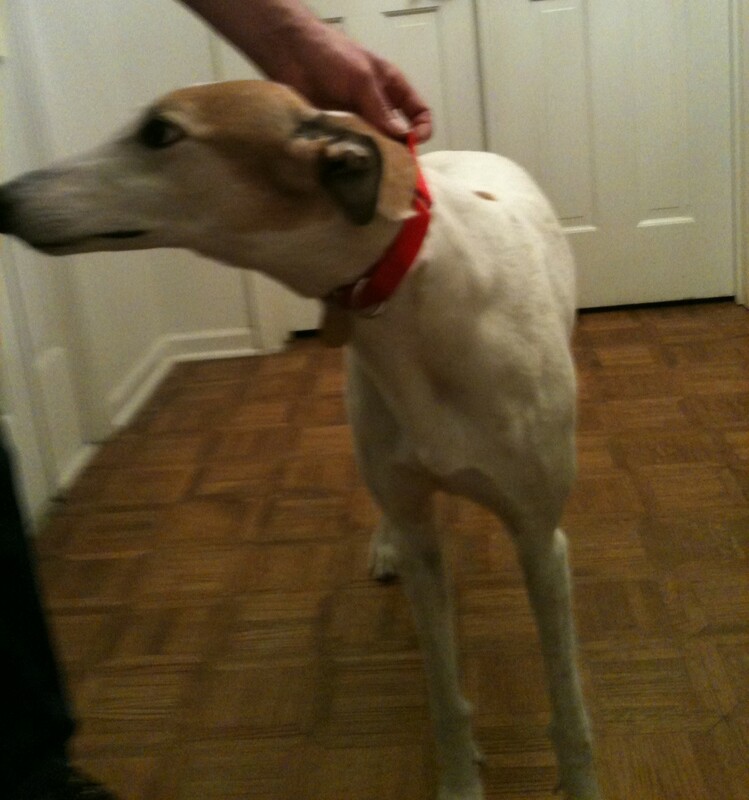 Ferrall tested small dog tolerant at the track and is living with a cat in his foster home. 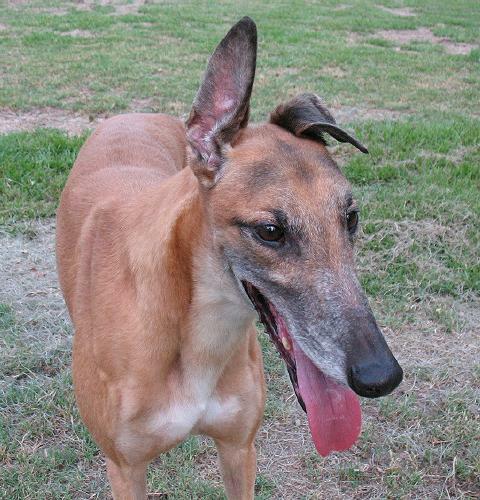 Ferral is an outgoing but calm laid back guy that will stand next to you and soak of as much love as he can get. He is a perfect gentleman that walks beautifully on leash. His first time in a house he walked in and layed down on the first dog bed he found. Definitely a couch potato! 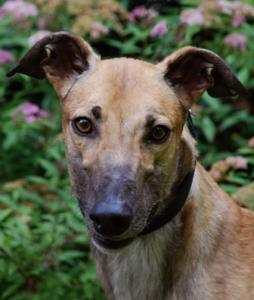 Ferrall seems like a great guy that will calmly make the transition to just about any home and seems like he would be perfect for a first time greyhound adopter that wants a calm loving guy. 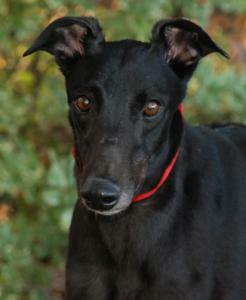 Blip is a calm, sweet black girl that raced at 66lbs. She will turn 4 on June 5th. 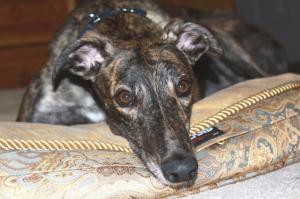 She tested cat and small dog tolerant at the track and is living in a foster home with both. Blip is polite and unassuming. She enjoys interacting with people and getting petted but isn't pushy for affection and will just quietly stand next to you waiting for you to notice and pet her. She seems to like being close to people and follows her foster mom around. Blip likes toys and will play with them some but she is a pretty low energy girl that often chooses not to run around with the other dogs and just stands next to her foster mom. 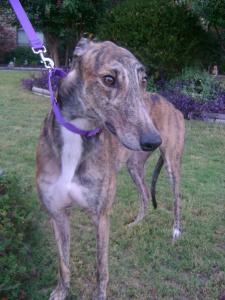 Her foster mom believes she would be an easy first greyhound since she is pretty low key. She can be just a little timid of loud noises and in new situations. She is quiet in her crate when other dogs are in the room with her but she does make some noise in the crate if alone so may not be the best dog for apartment living unless there are other dogs in the family. 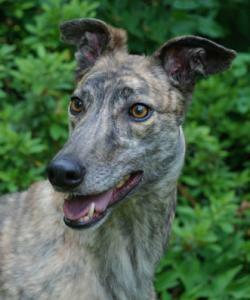 Lenny is a lighter brindle male with few brindle stripes. Lenny passed his cat and small dog test so should be fine living with either. He is an outgoing guy that is happy, pretty calm and well mannered.. He seems pretty confident and doesn't seem to get nervous easily. He loves to play with toys and carries them and puts them in a pile where he can find them later. He turned 3 on May 6th and raced at 61lbs so is a very small guy. He hasn't been around children yet but since he isn't a nervous dog that would be scared of them or overly active bouncing dog that would knock a small child down we think he would probably be fine with them. He gets along very well with other dogs and even let a kitten play on his legs without any reaction. He loves water and hopes his new family will buy him a baby pool of his own to play in. Miracle is the son of one of the broods that we placed a few years ago - Greys Eaglewings. Born Dec 11th 2007. He is a sweet, guy that raced at 76lbs. So far he has been pretty unsure of himself and a bit shy but seems like the type that will warm up with time. His photo is one we had of him as a pup please see his other photos for recent ones. He has settled into the routine at his foster home very fast. He travels well. 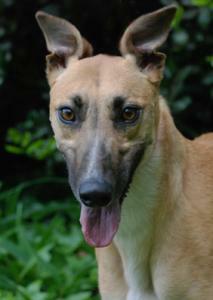 Miracle gets along well with the other greyhounds in his foster home too. Hank was adopted by the family that owns his mom and they are living together. Allie is a beautiful little girl that raced around 58lbs. She has the tiniest long needle nose with an overbite. 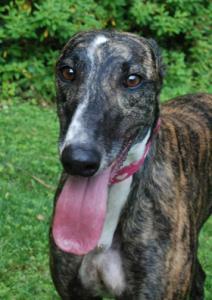 Allie is a friendly girl that is all white except for the brindle patch over half of her face and one ear. She has a few orange freckles in her fur on her back but black freckles on her one white ear. Very unusual and striking! Very sweet girl too. Allie raced for a long time. Allie turned five Feb 17th. She adjusted perfectly to foster care and is very well behaved and quiet and has done very well on potty training and only had a few accidents. She has already figured out what dog beds are for and loves laying on hers upside down with all 4 feet in the air. She is being fostered with children and is fantastic with them. Her foster mom is hoping Allie will go to a home with children because she is so good with them. Allie has a pretty high prey drive and didn't pass her test with the cat. She passed her initial small dog test though so should be able to live with them with a careful introduction. Jake is another economic return. 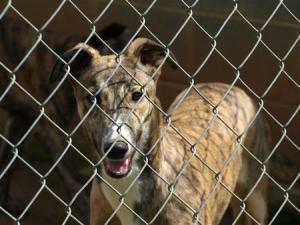 He and 4 other greyhounds were rehomed because their family moved and could not take them along. 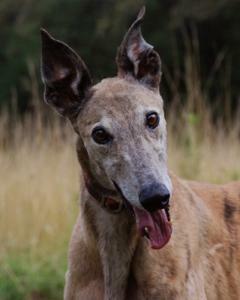 Jake was a very successful racer and retired about 2 years ago. He is already home acclimated because of his time in a home as a pet and has wonderful house manners. He was not returned because of any behavior problems and is quite the gentleman. 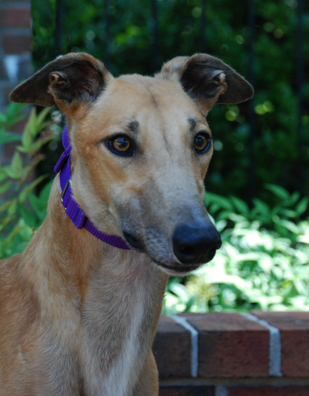 Jake is an unusual very light fawn color and is a large, gentle guy. Jake was fond of a 9 month old grandchild in his previous home and is in a foster home with children. He seems to enjoy having kids around. He also has lived with cats and small dogs before so would do great in a home with either. 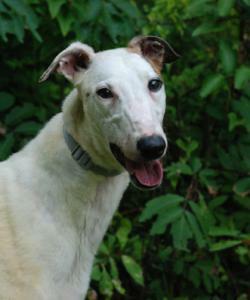 Jake is a friendly, happy, loving guy that gets along well with other dogs. He is pretty laid back lower energy guy so would be great for a busy home that didn't have a lot of time or energy to exercise a dog. Jake travels well and enjoys going for a ride. He is already a great pet with lots of love to give and will be an easy addition to some lucky home. Apache is a 75lb mostly white male. All around one of his eyes the hair is white even the eyelashes. The pigment is pink around the eye even though the eye itself is dark. That is how he got the "whiteeye" part of his name. His other eye has a dark patch beside it and has dark pigment all the way around. Makes him a very striking, unusual looking guy. He is a calm, friendly guy that seems like he will not be phased by much. He will probably be a great pet and an easy greyhound. He is missing one of his toes which is not unusual and won't effect his ability to run and play. Apache was born on July 21st 2006 so is almost 5. Foster Update! Apache is doing wonderfully! He is calm, quiet, friendly, and moves into every situation with good energy. He loves to meet new people and has interacted with every new dog he's met with completely appropriate body language and responses. He hasn't made a sound in his crate since the first night he arrived in foster care. Apache even potties on leash! 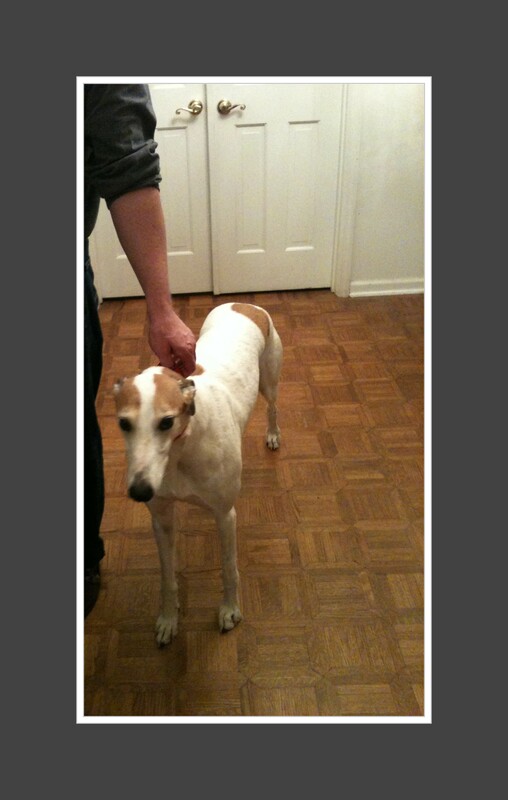 He is a really nice, even-mannered greyhound that will fit into almost any setting. 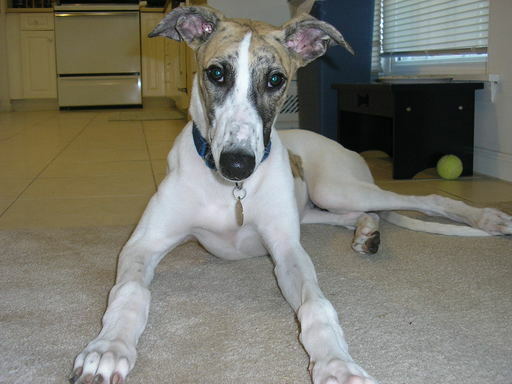 He would make an excellent first greyhound or addition to an existing pack. The foster family tells us he's the nicest guest to join them home in a very long time. Sweetie is a sweetheart. She is a little timid but warms up very quickly. She is a snuggler and is always ready to give hugs and nuzzles. She loves her greyhound brother, Bo, that she has been with for about 4 years. Sweetie and her brother Bo were returned due to some allergy issues in the family. She lived with children for years so should be excellent in a home with kids. She has been living with a small Jack Russell in her foster home so could also live in a home with small dogs. Sweetie is very bonded to Bo and we would love to keep them together. Special accomodations will be made to the adoption fee for the family with a heart large enough to hold these two. Update: Sweetie is in a new foster home to see how she will do away from her former housemate Bo. She is doing fantastic so we would consider adopting them separately. JD is a cute little guy that retired before he really got started at the track. He is young and turned two in January. He is sweet and not really shy but isn't the most confident guy so might need a little time to warm up. He is very good in his crate and retreats to the crate when he is nervous or wants to rest. He is very quiet so might be a good choice for an apartment or townhouse. He travels very well. JD is definitely safe with cats and small dogs and has been bullied by a cat in his foster home. Poor JD hides from the cat and that mean ol cat always finds him and picks on him. Update from JD's foster mom: JD is a really sweet, laid back, undemanding boy. He loves to get loving but definitely needs a few minutes to come around. He is cautious - I guess that is a good way to describe him. He is a submissive boy and we have had no problems with him in the house. He enjoys the crate & this is where we find him when the living room gets a little too busy for him. He really is a super easy foster boy. He is gorgeous with the dark eyeliner around his eyes.